Do you remember the 1980s? Big hair, big shoulder pads, big snoods and big trousers? It was a strange time to be live through, even as a kid (let’s be honest). The world was gripped by the ongoing tensions of the Cold War, Islamic militancy and the response of the United States and its allies was first emerging as the deadly ‘clash of civilizations’ that we have now become so wearily familiar with, unregulated free market capitalism was rampant (and eventually to be triumphant over its ideological foe in Communism). For some in the Western world anything seemed possible, all the vices as well as the virtues. It was the age of new technologies, when we first truly became tied to the electronic world around us – and fell in love with it. Affordable domestic computers were beginning to creep into people’s homes, along with game consoles (anyone remember Atari or the Sinclair ZX Spectrum?). TVs were now all-colour machines – and had infrared remotes to boot. Microwaves were the in-thing and car makers had discovered wind-tunnels and computer-aided design. Television frequently reflected this age of ‘the new’, especially at the populist end of the scale, and shows based around gimmicks and big ideas (especially technological ideas) became de rigueur. Into this wild arena of Cold War paranoia and the slow seduction of technology came two very similar TV series based around one single idea – crazy, souped-up super-helicopters. In the blue corner stood ‘Blue Thunder’, from the U.S. network ABC. In the red (actually slightly bluer) corner stood ‘Airwolf’ from the rival CBS network, and the production company of legendary television creator Donald Bellisario, maker of such hits as ‘Magnum, P.I.’ (1980-1988) and ‘Quantum Leap’ (1989-1993). Both shows got off to promising starts albeit from very different angles. 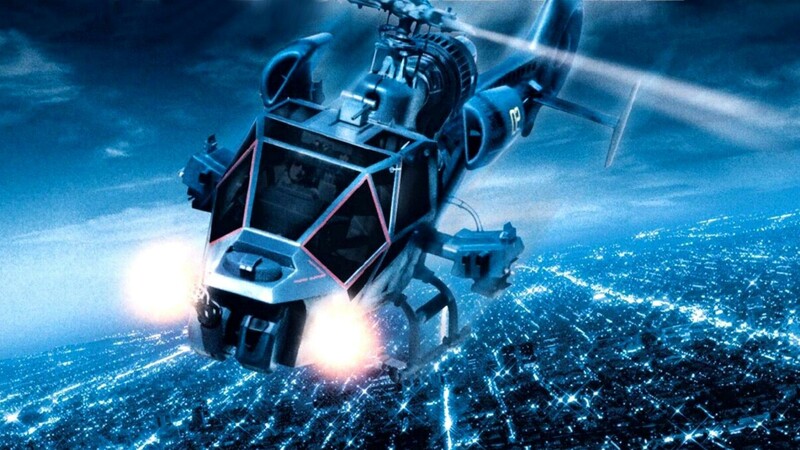 ‘Blue Thunder’ was an unexpected TV spinoff from a modest box office hit of the same name in 1983 starring the legendary Roy Scheider as a police helicopter pilot tasked with evaluating a new high-tech super-helicopter for law enforcement use (in reality a heavily adapted French-built Aérospatiale Gazelle). The movie was fun, if a typically Hollywood OTT affair, largely thanks to Scheider’s typically charismatic performance. The 1984 television series followed much of the same formula as its movie predecessor with relatively well-known small screen actor James Farentino taking the lead role and was notable for the presence of Dana Carvey, then a relative unknown, who played the co-pilot to Farention’s pilot before he found later fame with the long-running American TV comedy show ‘Saturday Night Live’ and the succeeding movie ‘Wayne’s World’ (1992). With a fairly formulaic 1980s cop show narrative, interspersed with poor special effects (mostly interior shots of the helicopter, with repetitious exterior scenes of the machine in action taken from the original movie), the show never really took off and was soon eclipsed in the ratings war by its arch rival ‘Airwolf’. After just one season the show was cancelled by the bosses at CBS unwilling to see beyond that week’s ratings. Also hitting the small screen in 1984, ‘Airwolf’ was a decidedly different creature from the not very believable cop procedural with a novelty factor that ‘Blue Thunder’ rapidly descended into. With a steely-eyed Jan-Michael Vincent in the lead role and Hollywood veteran Ernest Borgnine as his trusty side-kick the series could be best described as ‘Knightrider’ with wings (or chopper blades). The stories frequently turned on Cold War or espionage issues and those that didn’t do so normally involved the team taking on criminal gangs or corrupt politicians and business men around the United States. With a decidedly cooler looking helicopter (a slightly adapted Bell 222) and better special effects (albeit with a stock of repetitive long distant shots of the machine in flight – usually over desert locations) the stories eventually followed much the same formulaic route of American family-friendly TV drama in the 1980s after an initially slightly darker and more nuanced start. There were frequent references to the Vietnam War and fairly crude anti-Communist propaganda. Inevitably Latin America became a favourite locale for many episodes though it also took on Middle Eastern “terrorists”, as well as the evils of anti-Americanism and organised crime. Despite some liberal flourishes the show was very much of a conservative United States and the Regan White House and in later seasons it became more concerned with purely domestic American affairs, and more straightforwardly a high-octane action series. Eventually running far longer than its fellow helicopter rival ‘Airwolf’ managed to chalk up four seasons, including a jarring replacement of almost the entire cast in the fourth, before hitting the skids. It was never exactly noted for its stellar acting, with stilted unimaginative scripts and stereotypes in place of real characters for most of its run (including the one-eyed, patch-wearing spy-master who controlled the ‘Airwolf’ team). At times it seemed to take on the elements of some sort of third-rate superhero pastiche (complete with secret hideaway in the desert) and whatever creativity or originality that featured in the first season was soon sacrificed in the desperate pursuit of ratings and advertising revenue. Both shows are available on DVD, a slight DVD edition for ‘Blue Thunder’ and a larger boxed-set for ‘Airwolf’. Though popular viewing at the time among kids and young adults both retain a vaguely cult following today, mainly in the U.S. and from the same fans of ‘Knight Rider’. In all honestly time has not been kind to them and unlike some other quasi-Science Fiction series from the 1980s neither have aged well. The Cold War seems very far away now – though perhaps not quite as far as we like to think.